This publication explores the origins of ethnic school segregation. More specifically, it studies individual school choice processes and how they contribute to segregation. 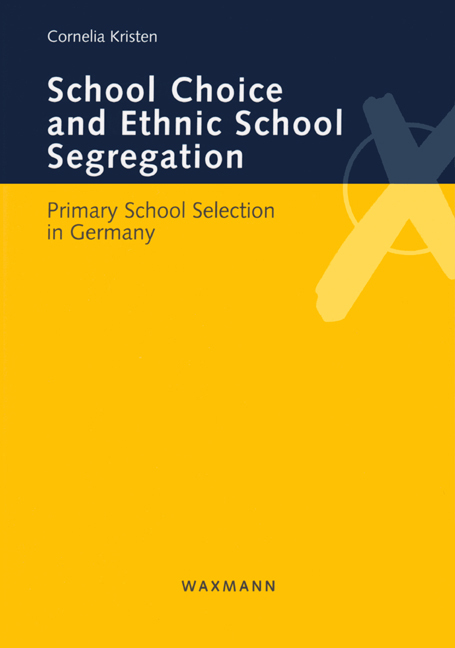 The author develops a general explanatory approach to school choice behavior and applies the theory to the German elementary school system. With the aid of a quantitative survey conducted in the federal state of North-Rhine Westphalia, she shows why families of Turkish origin make different school selection decisions from German families. The book reveals which general mechanisms lead to the emergence and persistence of ethnic and social stratification. Cornelia Kristen studied Social Sciences at the University of Mannheim, Germany, and at Indiana University Bloomington, USA. She conducted the research presented in this contribution at the Mannheim Centre for European Social Research (MZES), Germany, and at the Interuniversity Center for Social Science Theory and Methodology (ICS) in Groningen, the Netherlands. She is currently a postdoctoral researcher (wissenschaftliche Assistentin) at the University of Leipzig, Germany.